Cut 2 or 3 lands. You run 10 ramp without counting doublers. Or cut like 2 lands and 2 ramp. Eerie Interlude Not enough ETBs to count, if this is to dodge wraths boros charm and heroic intervention are better. Sylvan Library it's a great card, but I think you are trying to just ramp and get your value off your commander. Mana Geyser To me this is best in mono red or in something with X spells. Raging Regisaur it's in here for ping i think, you didn't seem to keen on it. Asceticism this and priv pos are both for protecting, with your 90 haste enablers I'm not sure i'd worry about protecting. Atzocan Seer idk, feel like i'd rather just kodama's reach. HIs second ability could be relevant. Commune with Dinosaurs Early gets a land, late gets a dino. Always replaces itself. Rampaging Ferocidon So good it's banned in standard, shuts down other creature based decks. Can hurt you but likely you are winning if this is hurting. Overwhelming Stampede Your average power is like 10 in this deck, +10/+10 and trample on everything ends games. That gets you no where near where you need to be. To me you have too many enchantments might look there more. Bow of Nylea or Grafted Exoskeleton as an easier way of getting your commander dead. Soul's Majesty, Life's Legacy, or Nissa's Revelation as card advantage (sorcery speed doesn't matter much when your hand doubles in size. Hunter's Insight and Hunter's Prowess seem like effective alternate ways to draw a ton of cards. Vivien's Invocation and Death's Presence seem fun, if not strictly connected. Pathbreaker Ibex, Dragon Throne of Tarkir, Berserk, and Surestrike Trident seem like effective ways to close out games. Ravenous Slime could discourage others from attacking into your commander. Trollhide and Blinding Fog seem like good ways to keep your commander alive for a bit. 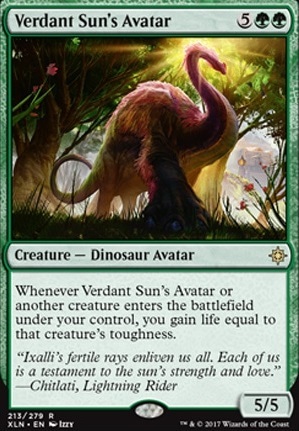 Verdant Sun's Avatar seems like a good way to keep yourself alive for a bit. 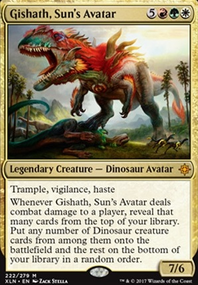 And lastly, Gigantosaurus, Crash of Rhino Beetles, and Phyrexian Dreadnought just seem like powerful beaters. Do bear in mind I have no idea what your meta, usual play-style, or budget is like when asking these questions. I am considering Grothama versus Ghalta for a green stompy build, so I'm kinda just throwing out ideas that I might use for either one. Most of the answers to your question are in Platinum Emperion's reminder text: "You can't gain or lose life. You can't pay any amount of life except 0." You don't gain life from the abilities on Zacama, Primal Calamity, Wurmcoil Engine, Verdant Sun's Avatar, or Dragonlord Dromoka. You don't lose life when you're dealt damage by Mana Vault or Ruric Thar, the Unbowed. You're not allowed to pay life to activate fetch lands, to let a shockland enter untapped, or to keep extra cards from Sylvan Library. 1/1/2011 The ability doesn’t prevent damage. Rather, it changes the results of that damage. For example, if a creature with lifelink deals damage to you, you won’t lose any life, but its controller will still gain that much life. Similarly, if a creature you control with lifelink deals damage to another player, that player will lose life but you won’t gain any life. Notably, if a creature with infect deals damage to you, you’ll get that many poison counters. 1/1/2011 Abilities that trigger whenever damage is dealt to you will still trigger because that damage is still dealt, even though your life total doesn’t change as a result. 1/1/2011 Spells and abilities that would normally cause you to gain or lose life still resolve, but the life-gain or life-loss part simply has no effect. 1/1/2011 You can’t pay a cost that includes the payment of any amount of life other than 0 life. connorbitw Hey man, you should try running Azusa, Lost but Seeking and Courser of Kruphix, both speed up land ramps like decks such as these. 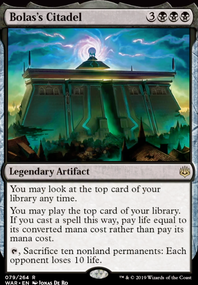 Also try looking to getting some Fetch lands and Shock lands. They're super helpfull in decks like this as well considering fetch lands can give you that extra land fall per turn. 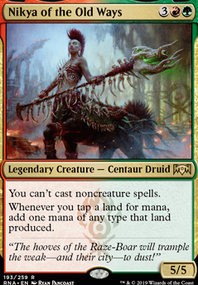 I would also try adding Oracle of Mul Daya she too would help your land ramp. I would also consider Omnath, Locus of Rage, he might be the strongest card for a deck like this. In general omnath is the way to go. Especially if you tech in Verdant Sun's Avatar you could literally gain like 40-50 life a turn. It would be awesome in this. I would try Vorinclex, Voice of Hunger. There are so many different techs but these are the main ones i would look into. Slagwurm Armor:I like the card, but the problem is I'd have to take a card out, any idea what card(s) I should take out? 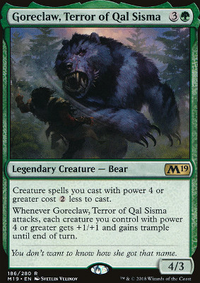 Oathsworn Giant:It is a nice anthem effect, but since it is on a creature it'll get removed easily. I'd rather play an enchantment or artifact. Forbidding Watchtower: Definitely! I love myself some flavor! Geist of the Archives: Depends if I'll find a wall to take out. Sight of the Scalelords:This is what I meant with the oathsworn giant. Nice card. Forgotten Ancient: But he doesn't have defender though. Conjurer's Closet: Nice! I'll think I'll replace Brago, King Eternal with this one. Verdant Sun's Avatar: I already have this one in the form of Angelic Chorus. Belligerent Brontodon: It doesn't let creatures with defender attack though, which both arcades and Assault Formation do. Bramble Sovereign: I already thought about this one, but it will depend if I want to spend the money on it.